The rate at which smart meters are being fitted has slowed, adding more pressure on a 2020 deadline already branded as unrealistic. Every home in Britain is supposed to have a smart meter, which avoids the need for customer readings, by the end of 2020. However, installation dropped by 16% in the final three months of 2018 compared with the same period the year before. Changing technology was one reason given for the slowdown. Smart Energy GB, which promotes smart meter technology, said that suppliers have been planning for a switch to second generation smart meters. This would have played a part in the falling installation rate among large suppliers. The fitting rate among the larger suppliers in the final quarter of 2018 was down 2% on the previous three months. By the end of 2018, 12.65 million smart meters were in operation in British homes, representing 25% of all domestic meters. Of these, 240,000 were second generation - or SMETS2 meters - which keep their smart operation when customers switch supplier. Most of the earlier versions go "dumb" at the point of switching, although a technology upgrade, without the need for another visit from an engineer, has been promised. Gillian Guy, from Citizens Advice, said: "It is worrying that at this key moment, when the switch to second generation smart meters should be accelerating, installation rates overall are actually slowing down. "Smart meters will provide benefits for customers, but with the rollout beset by technical problems, the current timetable is unrealistic. There's little chance that the 2020 deadline will be met, it should be extended to 2023." Natalie Hitchins, from consumer group Which?, said: "These latest figures show suppliers have a mountain to climb. "All parties involved should be focusing their resources on ensuring the rollout delivers on the promise to bring greater convenience and a more competitive energy market - not just hassle and soaring costs for customers, funded by their very own bills." In November, the National Audit Office (NAO) said that there was "no realistic prospect" of the government meeting its own deadline to install smart meters by the end of 2020. 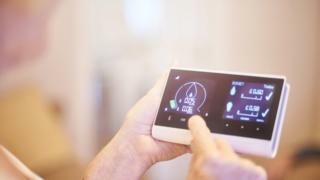 However, a spokesman for the Department for Business, Energy and Industrial Strategy (BEIS) said: "We've said everyone will be offered a smart meter by the end of 2020 to reap these benefits and we will meet that commitment." Why are smart meters important? Smart meters are designed to save consumers money, as it is said that they encourage householders to use less power. Because they can be read remotely, the costs to industry are also lower. They also enable consumers to use cheaper tariffs, by using power in the evening or at weekends. Four years ago, BEIS estimated that they would save consumers about £26 a year.